Next to cartoons which demands new music (usually very fast tempos) every ten seconds or so, writing film scores is truly a high art. I recently watched a movie from the 50’s called “I’ll Cry Tomorrow” which incidentally is the story of a singer who I had no knowledge of, Lillian Roth, her rise and fall from alcoholism, etc. But it was the score by one of the best known film writers Alex North that was incredible. Musicians like North, Bernard Herrmann, Elmer Bernstein, etc., were obviously well educated in both 20th century music and jazz, clearly evidenced in their harmonic choices. Of course the use of real orchestras makes a difference and as we all know that is a thing of the past for the most part. In the North score I heard a flute choir, acoustic guitar and flute duo, French horns with muted trombone and so on--rich, varied and truly high crafted orchestrations. It was real art-to match the visual with the aural and enhance the story line; what a great challenge that does still exist to some degree thankfully in our time with Zimmer, Morricone, Isham and others. In a similar vein talking to one of my students about the “old days” of recording just ten years ago before the computer where although we did cut and splice tape, musicians had to self correct mistakes of timing, intonation and assorted other tasks mostly on their own. I have to think that without the reliance on machines, one’s musicianship was well tested, consequently leading to general and continual self improvement. Of course the young musicians these days are better trained and maybe they wouldn’t have to correct as much, but there is something scary about the need to develop and improve musical skills when with the click of a button, matters of intonation, placement of beat and more can be corrected and made PERFECT. So…the way of the world…. Watching a great interview with the young, popular and controversial Chinese classical pianist Lang Lang on I was stuck by his analysis of Chopin’s music which he summarized (and demonstrated on U Tube) with three points: color, lyricism and poetry. I would say these are universal axioms which in jazz equates perfectly. Color is the sound that emanates from one’s instrument which is the first thing heard by the listener even before a musical shape is formed; lyricism refers to all the elements of phrasing, specifically the ability to “sing” a melody convincingly; poetry is rhythm, particularly the flow of music which includes the space between notes and phrases. Beautifully described by an elegant pianist. 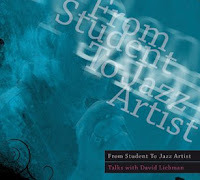 My master class this summer will be on “A Chromatic Approach to Jazz Melody and Harmony” which is the title of my book on the subject and constitutes the course I teach in the graduate division of the Manhattan School of Music in New York. It is open to all instrumentalists and emphasizes composition as well as the use of chromatic devices while improvising in any idiom. The dates are July 28 through Aug 2, 2009 held at East Stroudsburg University, East Stroudsburg, PA which is about one and a half hours from New York. Please go to my web site and on the main page click Saxophone/ Chromatic Master Class for information. 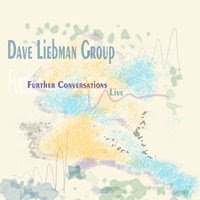 DAVE LIEBMAN GROUP LIVE:FURTHER CONVERSATIONS-True Azul: This is a great set recorded live in 2007 at the Mayfair Arts Festival in Allentown, PA which shows the group in high energy performance mode covering an entire gamut of styles from a reharmonized standard, “Green Dolphin Street” to the world music strains of “Anubis” and burning jazz “Victim.” Vic Juris who has been with me since 1991 really shines on this recording showing what a real guitarist can do besides the obvious which is to provide color and ambiance, comping and composing. AVAILABLE ONLY THROUGH DOWNLOAD: I tunes, Amazon, etc. HILARIOUS: My good friend and compatriot from Ireland, bassist/composer Ronan Guilfoyle was in Vietnam and found the following in a store. 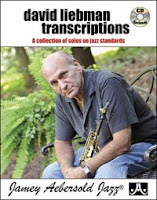 This is the height of bootlegging-it's hard for you to see here but the writing lists the members of the MJQ; the cover and inside folder also lists the MJQ and the tunes they play BUT with pictures of my group taken from my web site! 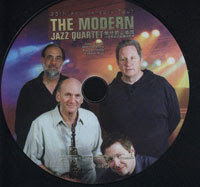 The DVD itself is the MJQ playing in germany in 1987.This is the height of ridiculousness. I have to make a poster out of it. I mean, do I look like Milt Jackson? In a period from mid October through right before Xmas I did two back to back European tours and two Midwest swings. I counted probably around 40 hotel rooms, 50 train stations, a couple of thousand miles driving and I can’t count how many planes. I am not complaining but it is daunting when I look at these figures because the tours I am talking about are one nighters and hard travel. We don’t have limos or private planes or much help until we get to the gig. My gratitude to the guys in my band and Marc for all their help in lugging valises and instruments. But of course in the end, the music and the audience’s response is worth it. I see more and older listeners are “getting it” (which for better or worse seems to be the majority of the audience that I see outside of colleges of course). As discussed in my last newsletter, with the DL Group we are recording in January and have been performing a chosen repertoire of Ornette Coleman, all original arrangements. With Marc Copland who is an harmonic master, the music ranges from spontaneous classic standards (“My Funny Valentine” “Impressions” “Round Midnight” to original compositions. I want to mention one new, very chromatic piece I wrote for Barack Obama called “Enfin” which in French means FINALLY-an ode to the long process and path that got an African American elected and the importance of this event in the long struggle against racism. We also do another very challenging piece called “Vendetta”. It’s great to be able to play with a musician with such a high level understanding of harmony. I am fortunate in this respect because after all, a horn player does not normally concern himself with such intricate questions of voice leading, dense chord voicings and inner voice movement, all the subtle musical elements that a pianist deals with everyday. This observation of course leads to the opinion that being a REAL pianist is by far, THE most challenging instrument-PERIOD! With the greatest respect to you guys……. PHILLIP ROTH: EXIT GHOST: I am a complete fan of Roth. I think his writing is fantastic and very psychologically accurate about people and what is happening in the moment. I felt that way reading Dostoevsky also-nothing escapes the eyes of this type of writer. The latest book “Exit Ghost” is probably depressing to some concerning the end of life, but for me, I found it fascinating and of great interest as to how one handle this inevitable passage. Highly recommended but not for the faint hearted. We all know that in the past decade or so Freddie Hubbard was not really playing much, but the truth is that if had stopped playing after the late 60s, I would still say the same thing about him, which is that he was the best of all time for me. His sound and ideas, his fire, his tunes and most of all his time were all incredible. He had the widest beat of anyone and made you really feel the pulse. He did it all-in and out harmonies-soft and loud-abstract with the blues, etc. He influenced everyone who is serious about jazz. I received two lessons inadvertently from Hub for which he would be surprised. On a recording session under Jimmy Cobb's leadership in the early 80's, I arranged one of my tunes for three horns: Freddie on flugel, Pee Wee Ellis on tenor and myself on soprano wiht a great rhtyhm section icluding Larry Willis and Walter Booker. Of course I was quite nervous about the tune, the arrangement, Freddie Hubbard, my shadow, etc-you get the point!! We did a take and of course there is that silence which occurs after the ringing of the cymbals subsides-who will talk first? The arranger, the leader or the "heavy" (Hub) in the room because turthfully everyone was in awe of Hub in and out of the band that day. Finally, in what seemed a lifetimge Hub says let's listen and of course I get the middle seat in the booth since it is my tune. Now, not that the tune was very hard, but there were some tricky things you had to stay alert about in the bridge (tune is "Picadilly Lilly"). Hub fluffed a note or two and of course though I was aware of it during the take, I was not about to say anything. To my mind at that point in my development as a jazz musician, guys like Freddie Hubbard ALWAYS got it perfect. After a few seconds, Hub yells from the back: "Liebman-that wasn't right-was it?" I answer the obvious and he says something like "I guess we have to do it again." Of course, by the third take he owned the tune!! Though it was never released, I learned an important and what might appear simplistic truth thanks to Hubtones which is that the best are that way BECAUSE they want to get it right. To what extent it is a matter of ego and/or artistic determination, the point is don't let anything go by that can be improved, no matter who you are. About ten years later in the early 90's, Hub was a guest with the local college band where I live in Stroudsburg, PA. The school is East Stroudsburg University and the great director who invited heavies like Hub in to play with a basically non-professional student band (no jazz major, etc) was my good friend Pat Dorian. As part of the gig, Freddie was asked to give a q and a in the afternoon for the general public. Knowing about Freddie and his legendary temperament, I was really wondering how his attitude would be for the afternoon session. Well, he was gracious, informative, modest and great all around. I went back stage to see him and commented on his "performance." He said that he had never done anything like that and he was actually nervous. I assured Hub that he was stellar. This was the very beginning of a period we are still in where no matter who you are, you will probably be ginving a clinic somewhere, sometime. I mean if Miles or Duke were around, they would be required to do it. In the early 90s's this was not common and it made me realize that a change has come when someone like Freddie Hubbard has to talk about his art to the public and like a playing gig, they will be judged on that "performance" as well. Thanks for the lessons Hubtones!